The Nature of the Soul. I will begin this article with two fundamental descriptive definitions of Spirit and Soul. So very often I hear people speak of Spirit and Soul interchangeably; at other times I find that when discussing Spirit and Soul we are using fully different references, resulting in confusion. The definitions that follow are, for the sake of clarity, what I mean when using the terms Spirit or Soul. Spirit is pure, eternal and non-corruptible. Awareness is the nature of Spirit. The essence of Spirit is frequency. In manifest form it is expressed as light and resonance. 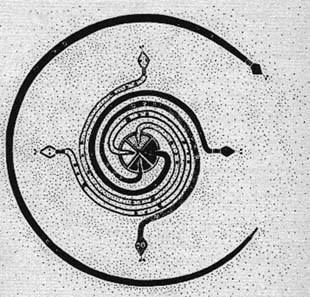 As the frequency of Spirit interpenetrates a field of life force (Soul) it sets that field resonating in a range of vibratory patterns that are made manifest as matter. Awareness in manifest form is expressed as Consciousness. Soul is comprised of life force and carries the imprint of experience and intent that is imparted to it by Spirit and the Body/Mind consciousness. This imprint is carried from lifetime to lifetime, though not always in conscious memory. Soul-force is mutable, that is it can be affected upon to be either life-positive or life-negative. This alteration occurs as a consequence of life experiences that may bring forth either joy or pain. Joy is the direct felt-experience of Spirit’s activation of our life force moving and pulsing through our body. When we act, choose or are influenced in a manner that is contradictory to our Spirit’s purpose we experience pain. One of the primary assets of the Shaman is his/her ability to assist the Spirit of the departed to make its journey through the realms of the Soul and on to the Other Side. This skill comes from the Shaman’s specific manner of Initiation, that of Death-by-Intent. That is, the Shaman Initiate undergoes a full physical cessation of life. Their Spirit then sojourns to the Other Side, not just to the ‘Light’ (we refer to the ‘Light’ as Grandfather Fire), nor simply into Grandfather Fire, but through Grandfather Fire and beyond it to the Other Side. There we are immersed in the Totality-of-All-Being. Therein we receive a Vision, and a Spiritual Gift inherent within that Vision. The task then becomes to find our way back to the body and heal it of that which brought about its death and to then reincarnate in the same physical body. This enables us, as Shamans, to recall whom we are, where we come from and what our purpose in life is. It is this unique journey that provides us with an experientially informed basis for the mythology of death, and what the Spirit undergoes upon death of the physical body. The study of this phenomenon, and the application of the insights gained, presents us with a guide as to how to live life in its fullest while still here, in and of the world. Having undergone this rite of initiation the Shaman of capability can confer upon another the ability, through training, to also make the journey to, though not into nor through, Grandfather Fire. This training becomes the foundation upon which a person can become one who is adept in the Art of Assisting Spirits in Transition. Upon death the Spirit remains in the earthly plane for three days, seeking release from attachment to people, places and things of its former life experience. During this time the Spirit of the departed may give very clear and unmistakable messages, or cause significant events to occur, that communicates to the still living loved ones the continuance of presence after death. Into the realm of the Soul the Spirit then enters. This journey takes forty-nine days. The forty-nine days are sub-divided into seven phases, of seven days each. A simple graphing of the Stars-Within (chakras) will provide an insight into the inherent structure of the transition. Each Star-Within is comprised of seven segments, each segment having an attribute of each of the other seven Stars-Within. During Day One the Spirit passes through the 1st chakra attribute of the 1st chakra. On Day two the Spirit moves into the 2nd chakra attribute of the 1st chakra. 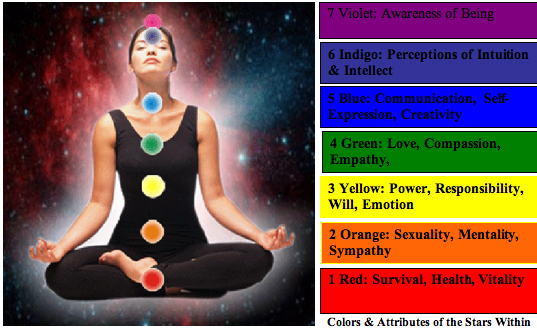 Day Three brings realization of the 3rd chakra attribute of the 1st chakra, and so on. Ultimately the Spirit, over the course of the forty-nine days, will have passed through all possible combinations, in all the Stars-Within, of interactive consciousness brought into being by life’s experiences. Into the UnderworldWhat transpires for the Spirit during these forty-nine days is of paramount importance. The realm that the Spirit is traversing is that of the Underworld, or Dream, Soul. It is the place our Awareness moves into during sleep. Our experiences within the Underworld Soul are then translated to waking Consciousness as dreams. When we awaken we may say, of a particularly potent dream, “Whew! It was just a dream!” However, while we are dreaming, the events that come about are very, very real to us. The Dream Realm is metaphoric in nature; all events, people and situations being symbolically relevant. Thus, when we encounter, in our dreams, a monster, we understand this to be a fear that we harbor. Demons are our guilts, symbolically dramatized. In the course of our self-investigations, either through meditation or other consciousness developing methodologies, we can insert our consciousness into the upper realms of the Underworld Soul, there to discover the underlying painful beliefs or suppressed traumas that cause disruption in our emotional and mental lives, or, conversely, to uncover the beauty and joy we have residing within us. If we encounter something of such intensity that we feel overwhelmed, we take a break, get a cup of coffee, go for a walk, and return to the task when we feel more up to it. The Spirit in transition has no such opportunity of taking a break. Once embarked upon, following death, the Spirit is inexorably drawn to the Other Side. The task of the Spirit during this transition is to embrace all that, during life, the person had engendered. For the most part the departed Spirits move through the Dream Realm, meeting what has been created in life with a certain degree of grace and ease. When there is that which is beyond the awareness level or capability of the sojourning Being to comprehend or embrace, the emotionally laden experience is drawn along, ultimately to be carried back into the next incarnation, where it surfaces once again as new life experiences that activate the emotional memory. That which is fully embraced becomes, in the person’s next incarnation, an attribute of awareness and a particular strength or beauty. The degree to which a Spirit embraces the All-That-Is of their Soul enables that Being to be empowered and enlightened in their next embodiment. Not always is the journey so easy, however. As the Underworld realm is deeply symbolic in nature, and as there is nowhere to escape to, one can be met with recapitulations of such intensity that the Spirit becomes derailed. When it is the monsters and demons that the Spirit encounters, remember: they are in the Dream. It is real, fully real, to that Being. There is no easy refreshment available, a moments respite in which to say “Whew! It was only a dream!” So when the monsters and demons are encountered, the Spirit is up against the deepest terrors and shame they could experience. Compassionate forgiveness is the quality of awareness that will bring surcease and release. The difficulty for some, who during their life had been particularly despicable, is that they will get backed up in the face of these emotionally generated manifestations and refuse to move forward. They become wanderers of the Underworld realm, enticing unwary people of a sensitive nature, feeding off their life force, speaking high-sounding nonsense and gibberish in order to inflate the unknowing person’s sense of esteem, all the while maintaining a contact at the feeding trough. In an even worse scenario the wandering entity slips into the Earthly realm and becomes an earth-bound Spirit, wreaking havoc in the lives of those to whom it attaches itself, feeding on the emotional disruptions that arise in the victim’s life as a consequence. When the Spirit in transition encounters the beauty and love that they, in life, had brought forth, these appear, in that dream-state, as beatific beings of light and beneficence, or, perhaps, rolling meadows of abundant life, flowers, animals and feelings of peace and joy. It is for the Spirit to embrace these experiences in loving self-acceptance. The challenge for the Spirit in transition, here, is to not get caught up in the illusion that this is ‘the end’, calling it heaven or nirvana or some such projected fantasy of desire. The danger is that the deluded Spirit may fall prey to the wandering entities mentioned above, who will generate fields of illusion to further placate the unsuspecting Spirit, keeping it trapped like a fly in a spider’s web. It is during these times of difficulty and challenge that the resources and knowledge of the Psychopomp (the funny sounding but official term for one who assists Spirits to the Other Side) comes into play. Having both knowledge and experience of the pathway through the Underworld, as well as the faculty of consciousness engaged, the Psychopomp is able to enter into compassionate empathy with the Spirit who has become stuck and attend to their release back into the journey across to the Other Side. Firstly required is the ability to move into a state of non-attachment. In this experience of neutrality the Emotional Mind is disengaged, no more the analytical, reactive, judgmental perspectives projecting themselves into every intuitive perception. This state of being is achieved through the Shamanic practice of the Eagle’s Meditation. From within this state of awareness one is able to experience the ‘Is-ness’ of what one encounters, within one’s own Soul or that of the Spirit that has become disabled. Free of Emotional Mind projections we can effectively embrace, in compassionate forgiveness and acceptance, the confused or disgruntled Spirit. Secondly we must be, authentically and from experience, rather than from a philosophical or metaphysical belief system, familiar with the experiences that the Spirit in Transition will encounter. This requires doing the deepest imaginable investigation within our own Soul. And beyond investigation, we must have nominally done the work of clearing obstructions that would derail, delude or frighten us off from the path through to the Other Side. Thirdly, familiarity with the path itself is necessary. This can only be brought about through active journeying, with awareness fully intact, through the Underworld and to Grandfather Fire. Exploring the mythos of our own Soul provides us with a map of the terrain, or cosmology, of the human Soul. Finally, for the Psychopomp to be successful requires that she/he have relationship with an Ancestral Spirit on the Other Side. The Ancestral Spirit performs the function of seeking the ancestors of the Spirit in Transition, so that the traversing Spirit may be met and greeted upon their return home to the Other Side. Also, the Ancestral Spirit provides the force that draws the entangled Spirit back on to the path home, and can be summoned for assistance when needed, if encountering a situation beyond one’s capability.